If you're looking for a great way to commemorate a special anniversary, a ring is an excellent choice. Anniversary rings come in a wide range of styles, and there's certain to be one suited to your personal preference, activity level, and budget. There are even anniversary rings for men. Consider all your options before you select the perfect ring to celebrate your years of marriage. Anniversary bands come in a variety of styles, and the best type for you depends on a number of factors. Consider the following questions as you browse. Which finger will you wear an anniversary ring on? Will it be on your right hand? Will it be on your left ring finger, along with your wedding ring? Will it be on a different finger on your left hand? There's no wrong way to wear the ring, but the finger and hand you choose may dictate the styles that will work for you. How active are you? If you work with your hands or take part in a lot of sports or hobbies that involve chemicals or rough work, you may need an anniversary ring that's extra durable. What is your budget? Depending on how much you can comfortably afford to spend, you may want to look at styles that involve diamonds and platinum or less expensive options like other gems and sterling silver or gold. One of the most popular styles of anniversary rings is the three-stone ring. Perhaps some of the popularity comes from the inherent symbolism; many people believe the three gems represent the past, present, and future of the relationship. You can find these rings in styles to complement your wedding ring, or you can choose a completely different look. You'll find anniversary gift options in a range of prices. Three-Stone Diamond Ring - If you're interested in splurging on your anniversary ring, nothing beats the sparkling beauty of diamonds. 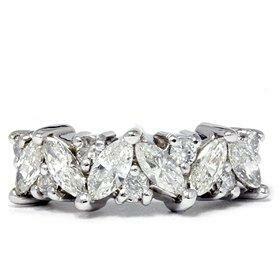 This exquisite design from Kay Jewelers includes two carats of round-cut diamonds set in a 14k white gold band. It's a great choice for a woman with a simple wedding set since it could be too much sparkle when paired with another elaborate diamond design. It comes in ring sizes 6.75 through 8.5 and retails for about $6,300. Triple Twist Band - This customizable, three-stone ring from Gemvara is a unique and contemporary choice that offers plenty of protection for the gems. You can choose the metal and gems you want in the design, which features beautiful interlacing bands that embrace the gems. In sterling silver with a 0.17-carat round diamond and two peridot gems, this retails for about $560. Two-Tone Three-Stone Diamond Anniversary Ring - If you're on a budget but still want something really special, this 10k yellow and white gold ring from Amazon.com may be ideal. It features three round diamonds set in white gold with a diamond-studded yellow gold band for a total weight of 0.94 carats. 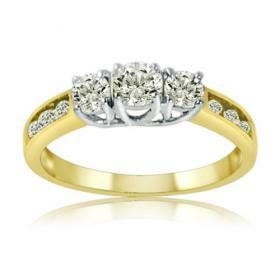 The lower karat of the gold enhances the durability of this design, and the lower prong settings protect the diamonds. This ring comes in sizes 5 through 8 and retails for $500. 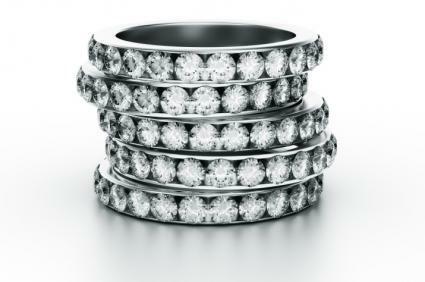 A diamond band is another exceptional choice for celebrating your anniversary. Some popular choices in this style include a pave-set diamond anniversary ring and an eternity ring, which many people believe symbolizes the unending nature of love. No matter which style you choose, and there are plenty to pick from, a diamond band is special and meaningful. The durability and style depend on the specific ring you choose, but many options can be ideal for women who use their hands a lot. You'll also find beautiful rings at any price point, so there's sure to be one that fits your budget. Starlight Diamond Band - This anniversary band from Blue Nile is ideal for someone who needs durable jewelry, since it features tiny diamonds bezel-set in sturdy platinum. The 0.20 carats of diamonds are protected well in this simple and modern style. If you have a contemporary-style wedding set, this may be the perfect design to complement it. This ring comes in sizes 4.5 through 8 and retails for about $1,100. Rose Gold Diamond Eternity Ring - Rose gold makes a warm, exciting change from white gold or platinum, and it really enhances this delicate design from Kay Jewelers. This ring, which features 0.50 total carats of tiny round-cut diamonds set in 14k rose gold, is perfect for women who love simple jewelry. This ring comes in sizes 4 through 9 and retails for about $1,000. Marquise and Round Diamond Anniversary Band - If you're looking for something unique, this 14k white gold ring from Amazon.com is an exceptional choice. It features a delicate-looking pattern of marquise and round-cut diamonds, which total 1.65 carats in weight. This design is better for someone who isn't too hard on jewelry, since the white gold isn't quite a durable as other materials, and the diamonds could catch on things. This ring has incredible sparkle and comes in sizes 4 through 10. It retails for just under $1,000. 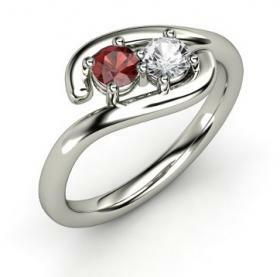 Gemstone rings are another beautiful way to celebrate an anniversary. You'll find them in all kinds of styles and price ranges, and there's sure to be one that will match your taste and budget. It's important to note that if you plan to wear your gemstone ring on the same hand as your wedding and engagement ring, you should select a stone color that complements the design of your other jewelry. Often, many women find it easier to wear gemstone rings on their right hand to avoid this challenge. Classic Floating Sapphire and Diamond Ring - This gorgeous ring from Blue Nile features four 3.2-millimeter round blue sapphires and three round diamonds with a weight of 0.39 carats. The gems are set in an alternating pattern in a two-millimeter platinum band, which gives them the illusion of floating on top of the ring. Despite being delicate, this ring is strong. Platinum is a durable choice, and sapphires and diamonds are some of the hardest materials on Earth. This could be a good choice if you are hard on jewelry. The ring comes in sizes 3 through 9 and retails for about $2,400. Double Embrace Ring - This pretty and contemporary design from Gemvara is fully customizable, so you can choose the metal you want, as well as the gemstones that represent both of your birthdays. In this simple ring, sweeping metal arms embrace the two four-millimeter birthstones for a lovely and simple statement. The durability depends on the gemstones and metal you choose, but in general, this ring may be vulnerable to catching on things due to its open and delicate shape. In platinum with a garnet and white sapphire, it retails for about $1,500. Garnet Heart Ring with Diamonds - Red is the traditional color of love, and it looks incredible in an anniversary ring that features heart-shaped garnets. This design from ApplesofGold.com is a great choice if you're looking for something meaningful that won't completely break the bank. It's crafted in 14k white gold and also includes two 0.15 carat white diamonds plus 16 more diamonds on the sides to add a little more sparkle to the center heart-shaped garnet. It comes in sizes 4 through 9 and retails for about $1,200. These days, anniversary rings aren't just for women. You can also purchase a beautiful band as an anniversary gift for a man. The traditional anniversary gift for guys is a nice watch, but there's no reason you have to follow that tradition. If your husband loves jewelry, there are many options out there, from men's designer diamond rings to bands that are simple and affordable. 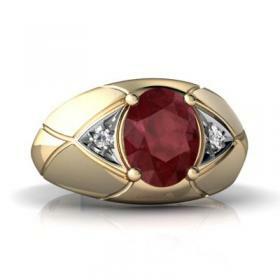 14k Yellow Gold and Ruby Men's Ring - A ruby is a beautiful gem for an anniversary ring since its red color calls to mind the concept of love. This 14k white gold men's ring features a 1.22-carat faceted oval ruby that's bezel-set in the center of the band. The ruby is flanked by diamond accents and the band features an etched design. This is a great, durable choice for a guy who is hard on jewelry. It comes in sizes 7 through 12 and retails for about $770. Men's Black Diamond Band - This masculine design from Crown Jewelers features 0.25 carats of round-cut black diamonds that are channel set in a 10k white gold band. The channel setting protects the diamonds, so if he works with his hands, this could be a great option. The ring comes in sizes 7 through 13 and retails for about $530. Trinity Ring - Men can also wear a three-stone ring as a celebration of the past, present, and future of their relationship. This exceptional design from Gemvara is completely customizable with your choice of gems and metals. Three round gems are bezel-set in the band, which provides them with plenty of protection from rough activities. In sterling silver with aquamarine and rock crystal, this ring retails for about $290. Take your time browsing over the bounty of anniversary rings available to you. No matter which design you select, you'll have a beautiful piece of jewelry that celebrates everything that is special and unique about your relationship.